Oh yes, you read that right, this is just part one. I apologize for the late post, I’ve been fight with the technology gods lately. I think it’s time to look into using a different program for the printables. I also apologize for what is going to be a super short post. It’s almost dinner time here, and I’ve been at the computer all day trying to get everything back to what it was supposed to be. But it was oh so worth the effort because I’m in love with my new calendar. Without any further ado, here it is. 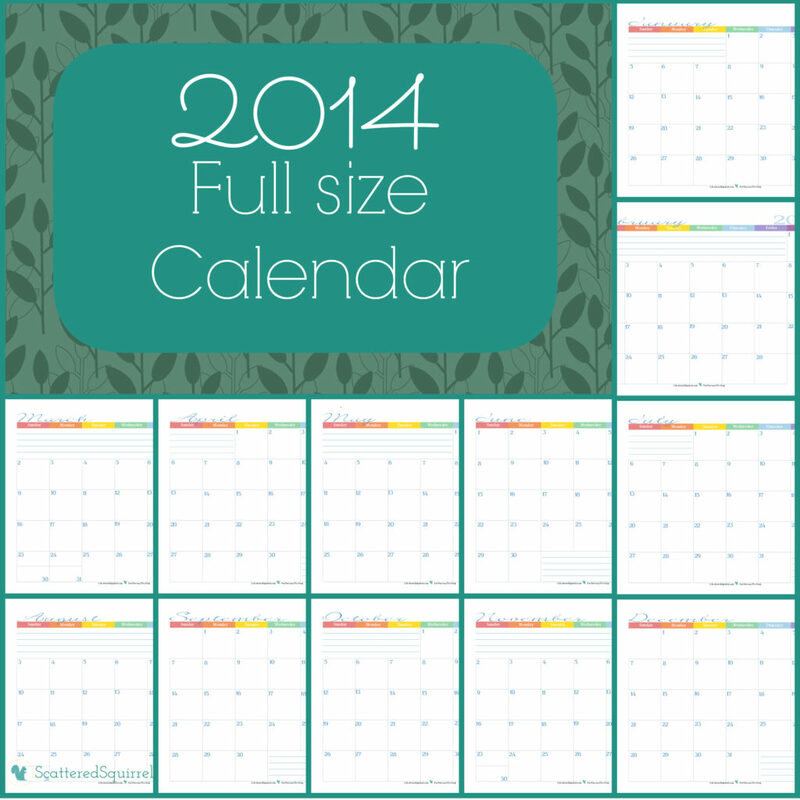 This one is a full size, single page, monthly calendar. Like many of the printables here on Scattered Squirrel, I opted to keep these one simple. New this year, I added in some lines in the empty spaces to create a notes section. I don’t know about you, but my calendars always end up with notes in the margins and in any space I’m not using. Have a space for it is kind of handy. Other than that, all I did was change up the colors and update the fonts, so if you like the ones I made last year, these ones will be right up your alley. As always to grab a copy of the printables for yourself, simply click on the picture. Again, I’m sorry to post and run, but I’ve got to go give Travis a hand in the kitchen, and I’ve got more calendars to finish up. Tomorrow (yep, a Thursday post!) I’ll be sharing the half size version of these ones, and on Friday I’ll have a couple more to share as well. To all my American friends, I wish you a wonderful Thanksgiving for tomorrow! If you sent in a request for your copy of the printable of the month, they are coming, I got a bit back logged with the dentist visits, I have another batch ready to go out later on tonight. If you haven’t snagged your copy of the printable, go here to fill out the form. All requests put in by 11:59 pm, PST, on December 1st will be honored. Until tomorrow my friends, have a wonderful evening!